Plate oil refers to burnt linseed oil which, in copper plate printing, is blended with pigment to make printing ink or to adjust the ink’s viscosity. It is included in copper plate printing ink as a medium to fix the pigment on to the plate surface. The ink must have sufficient hardness so that when it is packed into the depressions, it does not seep out when pressure is applied with the press, but it must also allow excess ink to be wiped off easily. Therefore the oil medium to be mixed with the pigment must not be gluey but have sufficient strength and moderate hardness. Ideal ink for copper plate printing can thus be made by using a medium prepared by burning away the fat from linseed oil known as plate oil. To make plate oil, first of all, pour some linseed oil in a deep pot and heat it until it smokes. Just before the oil boils, ignite the surface of the oil and take the pot off the heat. When lit, the oil will burn with a flame. After a reasonable amount of time, place a lid on the pot to shut off the air and put the fire out. The viscosity will depend on the length of time the oil is burned. If this is short, the oil becomes soft, if it is long, it becomes hard. The appropriate hardness will depend on printing styles and personal preferences, so it is best to prepare several batches with varying viscosity. This process should always be carried out outdoors as it produces strong odors and smoke, and entails the risk of fire. Commercial plate oil is available in several levels of viscosity and can be selected according to purpose. 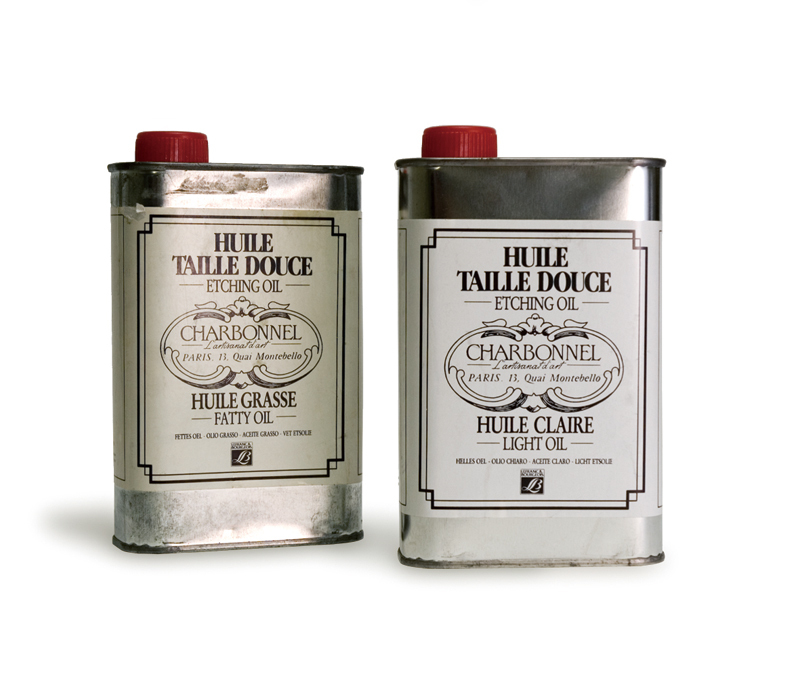 Plate oil can be purchased at art supply stores that handle printing supplies.